“Gay people -Men- gather together under one roof and decide to have a competition amongst themselves: BALLS. 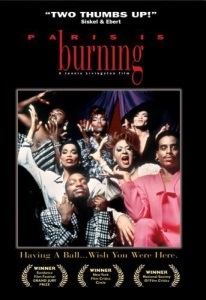 This movie is about the ball circuit, and the gay people that’s involved in it, and how each person’s life brought them to this circuit.” Filmed over seven years, Paris Is Burning is Jennie Livingston’s legendary documentary about gay ball culture in New York City in the 1980s. Paris Is Burning deserves a better post, but I was unable to make something comprehensive enough so I ended up throwing up a stub as a conversation starter. It’s surely my favorite documentary of all time, and one that makes me increasingly nostalgic and angry as time goes on. Such an incredible culture, yet one that seemingly wouldn’t exist if society hadn’t treated gay people, trans people and POC in such a beastly way. A celebration, a tragedy, an outrage and -with the mainstreaming of some parts of gay culture- very debatably a triumph, all rolled into one. I love showing this movie to people who've never seen it. When I'm trying to convince someone, I say, imagine someone filmed a documentary in Atlantis as it was sinking. That's how this movie feels to me. It's very full of life, but you see all the enormous vibrancy of the ball scene in front of a background of AIDS and violence. The footage of Venus smiling as you learn that her body was found under a bed in a seedy hotel -- it just slays me, every time. So much of this movie stays with you -- like Willy Ninja's dreams of making it big, and Octavia in that mall waiting in line for the modelling competition, and that guy on the sidewalk talking about feeling like there was nothing wrong with you at the ball, and then saying, "It's not that way in the world, it's not that way in the world." It's all very powerful, to me. So, I guess this would've been summer of 1990. I was spending the summer at my Dad's in suburbs of Kansas City in between sophomore and junior years of college. Was only recently "out" to my Dad, who handled it quite well, just that the gay world was quite a foreign thing to him so there was just a lot he didn't "get." It was just Dad and I living in the house, though he was starting again to date his ex-wife. (Long story, but after their divorce over her bi-polar-ness she'd started to improve and they were trying to see if they could revive the relationship.) One Saturday night they went out for the evening. I think I stayed home watching TV or whatever. Kansas City only had one real "art cinema" at the time - I think it was called the Tivoli, in Westport. I knew Dad and the ex sometimes went to movies there and I remember that night laughing to myself thinking "wouldn't it be funny if they went to Paris Is Burning without knowing what it was. LOL." Next morning Dad comes to me. "So, we went to this movie last night.. 'Is Paris Burning?' [sic]. I think I have some questions...."
This is such a beautiful film. And very interesting in that it's a picture of a time when the identities of gay man and trans woman visibly had not been definitively separated out, even within the community. The real shock, in a way, is the surrounding context: knowing that almost all of them have since passed. And not slowly, but within a few years of the movie's appearance. A tidal wave of death. I just watched it for the first time, and definite punch in the gut. Watching it now, so many swirling thoughts about appropriation and gender roles and the 80s in general. Weirdly, a lot of "America's Next Top Model" retrospectively makes way more sense. Also just the IMMENSE pressure to pass, and the nuanced understanding of why that was both simultaneously liberating and oppressive. I was young enough during the time period to have thought that Madonna invented Vogueing, and while I had kind of figured out in the interim that she appropriated it, it was mindblowing to see the origins. Ditto for a lot of the slang. I'm cis het but had been very immersed in the white gay community and feel like I have a pretty reasonable understanding of history there; it was illuminating to see how much of the POC perspective I was totally ignorant of. Another thing about the movie, considered as an aging documentary: most documentaries portray something that exists as an increasing remove as time goes on, or whose influence is felt at a remove. Roger and Me explains Flint, but Flint isn't next door to most of us. By contrast, this is a movie that you feel right in the memes. It is present every day, riding in my head right next to the word "shade".